Infographics, though not a new concept, has evolved rapidly and accelerated quickly in its use and significance. Infographic is a concept where a piece of information, is presented visually with the use of some analytic tools and graphics such as Charts, graphs or just images with the minimal test. The information is presented so as to help the spectator infer an instant meaning from it. It is the combination of text and images which also helps in grabbing the attention of your audience. Infographics have already established a firm presence and significance in the Digital Marketing world. With the right and skillful use of this great data component, you can leverage many benefits for your business. Building a safe brand image can be a challenging task sometimes but if your strategy is strong you can easily encounter this challenge. 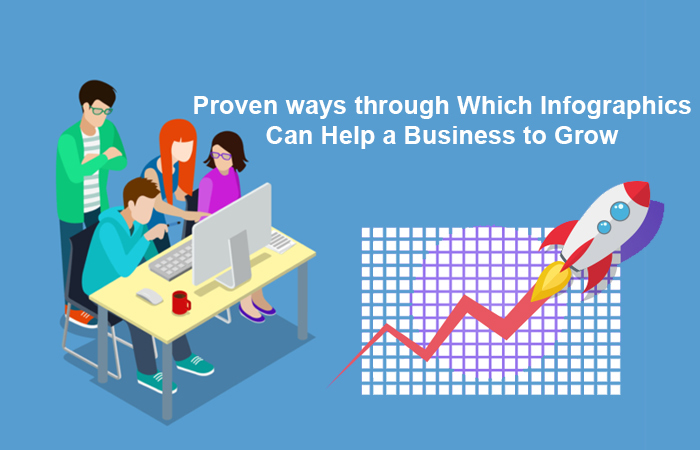 Let us look at some of the proven ways in which you can use infographics and accelerate your business growth. First thing in an infographic should be the intriguing nature. Make your infographic as intriguing as possible. Equip it with a considerable amount of information. Include text, image clips, and analytics in the right proportion. Promoting the sale in a visual manner can help in generating a high number of leads. Also, make your infographic sharable to widen and expand the reach. You can also create an embeddable code so that people can share your infographic. Research the latest information about your industry and include stats and figures to support the recent studies and developments in your infographics. Infographics are proven to drive sales. The reason is the high perceptibility of the visual content. The human mind can access the visual information in 250 ms. It is also seen that the infographic can increase the conversions by over 12%. Therefore, this great communicative piece should be shared as much as possible and as proactively as possible. Facebook and Twitter are the common and obvious platforms to share the infographics, however, you can also consider sharing on Instagram, Email marketing, Pinterest as well as LinkedIn. The right and smart use of the infographic would contribute in increased conversion. An engaging and attention-grabbing Call to action button is an essential part of an attractive infographic. Infographic works at grabbing the attention of the mass audience but the real work is to instigate them towards the action. The Call to action button works great in this context. It is researched and suggested that the red colored and green colored call to action button runs a greater chance of the conversions. The title used on the Call to action button too should be catchy and effective. Publish your infographic on the popular sites. The visibility of your infographic is also a very important thing which is integral to the success of the infographic strategy.